Sunny days ahead for solar? 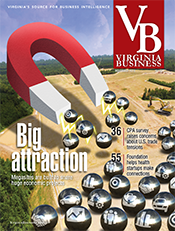 The development of solar energy in Virginia has switched into high gear. Driving the growth is a huge appetite for solar-generated electricity from the nation’s biggest technology companies — Amazon, Microsoft, Google and Facebook. 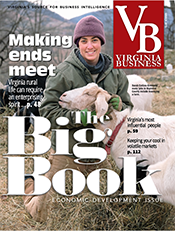 They are setting up shop in Virginia and insisting on renewable energy to power their facilities. A recent court ruling giving companies more choices in terms of solar providers also promises to expand the market. Virginia currently ranks 17th nationally for installed solar capacity with 631.3 megawatts, according to the the Solar Energy Industries Association (SEIA). That’s a big jump from the 49 megawatts of installed solar capacity reported by the SEIA in a September 2016 report, when Virginia ranked 29th nationally. Morgan Lyons, SEIA’s communications manager, described Virginia as a “fast-growing market” that added 381.3 megawatts of solar capacity last year, more than half of which is currently installed in the state. 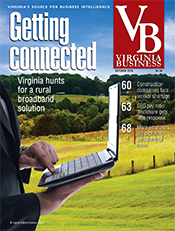 For their part, technology companies are populating Virginia with energy-hungry data centers. 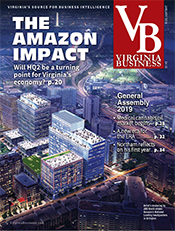 Ashburn’s “Data Center Alley,” for example, now has the largest concentration of data centers in the world, with more than 70 percent of the world’s internet traffic passing through Loudoun County’s digital infrastructure. In late 2017, Google announced it would build two more data centers in Loudoun, after purchasing 148 acres of land for $70 million. Also driving solar energy growth is a steep drop in price. According to one industry source, the cost to develop a kilowatt of solar power has fallen from $96 in 1970 to 40 cents this year. 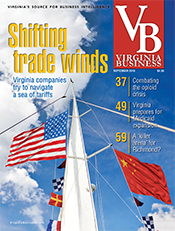 So, it’s no wonder that Virginia entities — from the governor’s office to the state’s largest utilities to private companies — are scrambling to corral solar, on a commercial and residential scale. Kenneth Jurman, renewable energy program manager at the Virginia Department of Mines, Minerals and Energy (DMME), notes a tipping point that helped ignite the current wave of solar development. For a number of years, he says, the largest solar facility in Virginia was a 2.1-megawatt array at Naval Station Norfolk built in 2012. Then, in 2015, Amazon Web Services sent a shock wave through Virginia’s Eastern Shore with a proposal to build an 80-megawatt, 1,000-acre solar farm in Accomack County. Amazon Web Services has its Eastern corporate campus in Fairfax County. 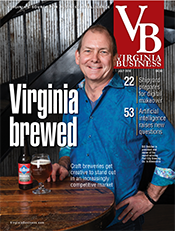 Its parent company, Amazon.com, also has data centers and warehouses in Virginia. The Accomack project was subsequently acquired by Dominion Energy from the original developer, Community Energy Inc.
“The prices on solar have come down so much, it was only a matter of time before they became competitive,” Jurman says. A spokesman for the Virginia Department of Environmental Quality (DEQ) says there are 59 notices of intent awaiting action that represent about 2,646 megawatts of solar. Going forward, John Warren, DMME’s director, expects the state to focus on programs that penetrate more under-served markets. “There is little customer choice, and there is significant growth opportunity in the small-customer market areas. 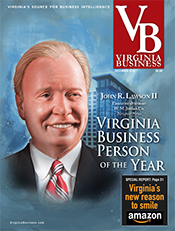 I would expect to see support for this reflected in future state budget processes,” Warren told Virginia Business in an email. In the meantime, large projects are grabbing headlines. Salt Lake City-based sPower is the developer behind a proposed 500-megawatt solar installation in rural Spotsylvania County. Most of the power, 315 megawatts, would be purchased by Microsoft, the Redmond, Wash.-based software giant. Microsoft says it would be the largest corporate purchase of solar power in the U.S. If the project receives the necessary approvals for construction, it will put Virginia on the solar map. 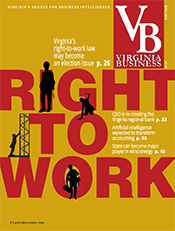 Ivy Main, renewable energy chair for the Virginia Chapter of the Sierra Club, says, “Virginia leaders have woken up to the new reality of solar as not just a clean, renewable resource, but also a low-cost one that offers a big opportunity for jobs and economic development — and a great way to attract tech companies to the state. “Unfortunately,” Main adds, the [General Assembly] hasn’t addressed the other half of the solar pie — solar in Virginia communities. Owners of multifamily housing can’t put solar arrays on their roofs and sell the output to tenants. A customer can’t put solar arrays on one building on a property and use it on another if it is separately metered. This year’s General Assembly passed an extensive overhaul of the state’s utility regulations, which took effect on July 1. The Grid Transformation and Security Act calls for 5,000 new megawatts of solar and wind energy, including 500 MW for small, community solar projects, of one megawatt or less, says Pridgen of Dominion. In that smaller group, 50MW will come from rooftop panels. Dominion also has an application pending before the State Corporation Commission for a community solar program that would allow more residential and business customers, who may not wish to invest in solar panels, to choose solar without having to install it on their rooftops. Instead, they could have a portion of their energy needs met by community-based solar facilities on the Dominion Energy grid. Dominion — now one of the top seven utilities nationwide in solar-generating capacity — has been developing its resources. In 2015, the energy giant had just over 1 megawatt of operational solar power. Today, it has 745 megawatts in operation, under construction or announced, the utility says. Those projects include construction of 300 megawatts of solar facilities to support Facebook’s eighth data center in the U.S., to be located in Henrico County. Henrico officials expect the facility to become the county’s biggest taxpayer. Facebook’s direct investment would be $750 million, but that number will total about $1 billion by the time the multiphase project is completed next year. That amount includes hundreds of millions of dollars spent creating solar-energy facilities across the commonwealth under an arrangement with Dominion to power the data center with 100 percent renewable energy. Dominion is at the beginning of what it says is a major solar expansion. The utility predicted it would expand what it called its “solar fleet” by 4,720 megawatts of capacity during the next 15 years, according to the integrated resource plan (IRP) recently filed with the State Corporation Commission. That’s enough to power 1.18 million homes. That solar expansion represents an increase of nearly 50 percent above 3,200 megawatts in solar capacity that Dominion forecast in 2017. 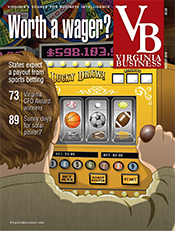 The Virginia Supreme Court threw some cold water on Dominion’s solar ambitions in March when it ruled that big electricity users could purchase 100 percent renewable energy from sources other than Dominion without restrictions. Dominion argued that large customers that purchased renewable power from other sources would need to give it five years’ notice if they returned to the utility. Dominion said that much time was needed to plan future generation needs. The court, however, ruled that the five-year provision does not apply. 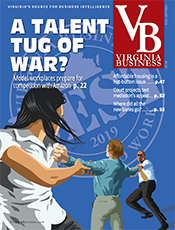 The Virginia Supreme Court’s decision “made clear that Dominion couldn’t control or impede the renewable energy industry, which is adding jobs faster than almost any other industry in the nation. If customers want clean energy, they have a right to get it, regardless of what the utilities say,“ Will Cleveland, an attorney for the Southern Environmental Law Center, said in a news release, responding to the court’s decision. One thing is certain: There is room for a lot more solar expansion in Virginia. Neighboring states, such as North Carolina, are way ahead of the Old Dominion. The Tar Heel state ranked second in the nation in terms of installed solar capacity last year, with 4,411 megawatts, according to SEIA. That means 4.6 percent of North Carolina’s electricity is powered by solar. Currently, less than half of one percent of Virginia’s electricity comes from solar, according to SEIA. Landowners in every part of the state also are being pulled into expansion of solar in Virginia. Dominion says that, generally speaking, ground-mounted solar arrays use about 8 acres of land for every megawatt produced. Historic Newcastle Farm in Hanover County is expected to become the site of one of the largest solar farms in the Richmond area. 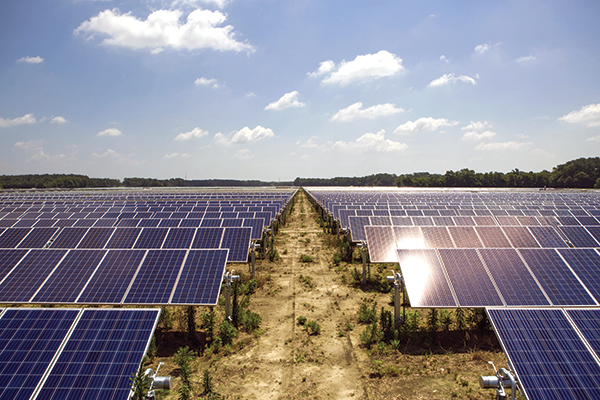 North Carolina-based Sun­Energy1 has received approval to build a 20-megawatt solar project on 184 acres of the farm’s more than 500 acres under a 30-year leasing arrangement. 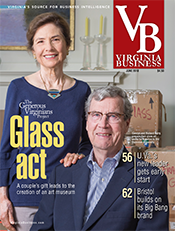 Henry Broaddus, vice president for strategic initiatives and public affairs at the College of William & Mary, owns the property with his mother. Broaddus won’t discuss his financial arrangements with SunEnergy1, but he points to a recent article about solar farm leases in Fortune magazine. It reports that landowners hosting solar farms received $300 to $700 an acre per year, based on data from the North Carolina Sustainable Energy Association. Broaddus, who received many inquiries about leasing his property, describes the dynamic between solar developers and landowners as a “Wild-West scenario” in which there could be multiple bidders and lots of negotiations.